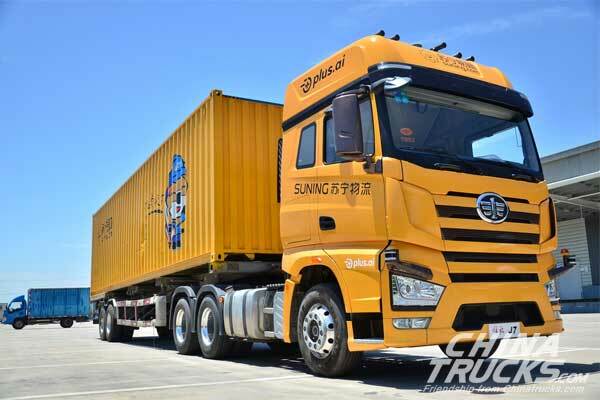 Suning Logistics, a subsidiary of Chinese commercial giant Suning Holdings Group, has completed driving tests for its autonomous heavy-duty truck, "Strolling Dragon," in Shanghai, marking another milestone in the company's plan to offer fully-automated logistics solutions. Strolling Dragon is the largest unmanned truck in Suning Logistics' automated fleet, boasting Level-4 self-driving capabilities; it is highly automated, and is able to operate without human input within pre-programmed parameters. It is the first self-driving truck developed by a Chinese e-commerce company to pass logistics campus tests and highway-scenario road tests in China. "The success of Strolling Dragon's self-driving tests is a groundbreaking accomplishment for Suning, and represents another step forward in our Online-to-Offline (O2O) smart retail strategy," Zhang Jindong, Chairman of Suning Holdings Group said. "Suning's goal is to develop its logistics business into the biggest and most intelligent retail infrastructure network in China. The promise of automation solutions will not only boost efficiency in Suning's logistics operations, but also benefit the industry, and consumers, by offering more possibilities, and a better shopping experience." Equipped with cutting-edge artificial intelligence (AI), deep-learning technologies, and high-tech gadgets such as laser radar, Strolling Dragon has superhuman vision that enables it to accurately recognize obstacles at a distance of over 300 meters, even at high speed. In addition, the unmanned truck can make emergency stops, or avoid obstacles at a response rate of 25 ms, allowing for safe autonomous driving even at a speed of 80 km/h. Strolling Dragon is part of Sunning's strategy to provide fully-automated logistics solutions powered by AI. The company launched its Automated Guided Vehicles (AGV) warehouse ahead of the "11/11", or "Singles Day" shopping festival in 2017, providing a "goods-to-people" solution instead of the traditional "people-to-goods" model. As a result, the time spent selecting an item from shelves during the fulfillment process has been shortened to 10 seconds - five times more efficient than manual work. In April, Suning Logistics rolled out its "Biu" autonomous delivery robots, which can work around the clock to deliver goods directly to customers. With the expansion of its robot warehouse networks, as well as its drone delivery network that has started normal operation, Sunning Logistics is building a logistics chain that is more and more automated. Global vehicle giants including Daimler and Tesla are pioneering self-driving trucks. Compared with automated cars, Suning's self-driving trucks are closer to commercialization, thanks to less complicated working environments, as trucks used for delivery spend most of their time on highways. Sunning will continue to collaborate with technology firms to build a smart logistics system in which self-driving trucks, automated vehicles and robots work seamlessly to do the delivery job for humans. When considering the implications of applying automation technology to vehicles, Suning's plans call for drivers to be assisted rather than replaced, for the foreseeable future. The relatively complex and tiring job of long-distance driving puts drivers in high risk of accidents, while automation helps reduce such risk. With the help of self-driving technology, Suning Logistics can help create a more comfortable, and safer, working environment for over 100,000 truck drivers working for the company.